Sadly, we announce that James S. Birdsill, age 81, died due to cardiac arrest on February 27th, in Grand Junction. Jim was in the March 1963 class and assigned to Artesia upon leaving the academy. Later that year, he transferred to Craig and stayed there until he resigned in May 1965 with a bit over 2 years service. He went on to become a police officer in Grand Junction and retired from Grand Junction PD after 25 years. He was also a member of the Blue Knights MC Club. Services will be held at 12:00 pm on Tuesday, March 5th, at the First United Methodist Church, 522 White Avenue in Grand Junction. The family requests donations to the First United Methodist Church in lieu of flowers. Jim's untimely leaving left all of us with much more than the empty feeling in our stomachs and hole in our hearts. We miss Jim, his happy outlook, and friendly manner. In addition, Jim left his lovely wife Alice with something else: A 2004 Honda Gold Wing Trike with a trailer. It is FOR SALE. Here are the details. For membership information, call Bill Gert at 242-0463. 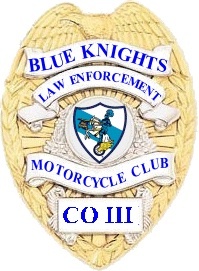 You must be in law enforcement and you must ride a motorcycle to be eligible to join the Blue Knights. Watch this VIDEO to learn all about our club and why you should join. If this doesn't work for you, go to PICTURES PAGE and see the video on the bottom.